"Mirror mirror on the wall" is the name of a well-known German fairy tale. "Who's the fairest of them all? ", however, is not answered by the mirrors in the Spanish desert. There, with the help of several thousand mirrors, the power of the sun is harnessed for renewable energy. HARTING supports solar power towers with robust, reliable Han and PushPull connectors for supplying power and data. 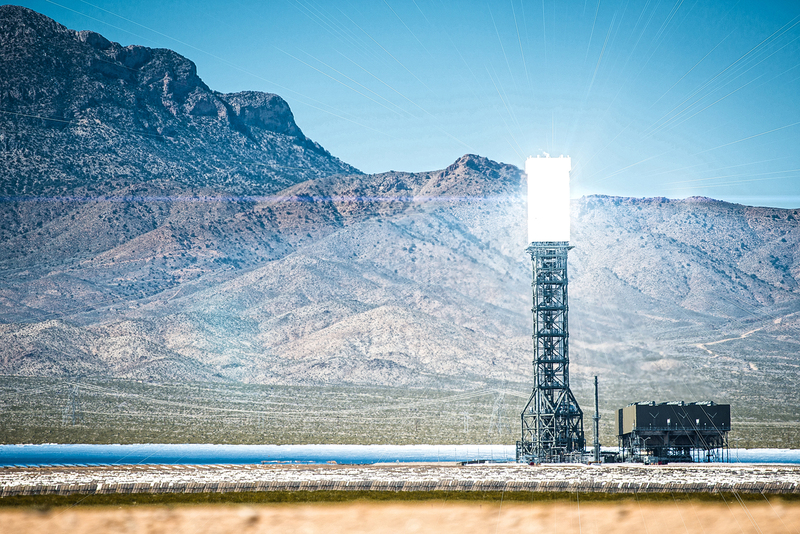 Solar thermal power plants, such as the one in the Spanish Sierra Nevada, use thousands of individual mirrors to focus sunlight onto a single point in a tower. Many of us have tried this as a child using a magnifying glass. By focussing the sun's light rays from a large area onto a small focal point, it is quite easy to generate very high temperatures. This same effect is used in the so-called solar power towers. Here, the sunlight is captured on up to 100 hectares of mirrored surfaces. The mirrors are then intelligently adjusted to focus on a single point at the top of a tower. There is a container at the top (called an absorber) which is filled with water, oil or liquid nitrate. The liquid is heated to over 1000 degrees Celsius. This then runs into a heat exchanger where the hot liquid generates water vapour. As in conventional power plants, the water vapour is used to drive conventional steam turbines which in turn generate electricity. This heating circuit is supplemented by a thermal storage during nighttime or periods of weak sunlight. The thermal storage is charged during the day at the same time that the system is generating electricity. The system thereby ensures continuous, uninterrupted generation of energy. The heat storage mechanism consists of two separate tanks which contain liquid salt of 60% sodium nitrate and 40% potassium nitrate. To charge the tank, the salt from the cooler of the two tanks is pumped through a heat exchanger into the warmer tank. This saves the heat energy for several hours and can ideally supply heat energy during the entire night for generating electricity. In order to ensure optimal system efficiency, all mirrors must always focus precisely on the tower's focal point. The mirror components, called heliostats, are equipped with positioning drives that track the mirrors. These align the mirrors continually according to the position of the sun so that they are focussed on the tower top. Each heliostat requires a distribution box for supplying power and data to accomplish its task. HARTING's robust and reliable connectors are used for the power and data cables so that repair and conversion work can be carried out quickly and inexpensively. If a distributor box has to be replaced, the connectors can simply be unplugged, the box replaced, and the connectors reconnected in a matter of seconds. This minimises the downtimes of the mirrors. 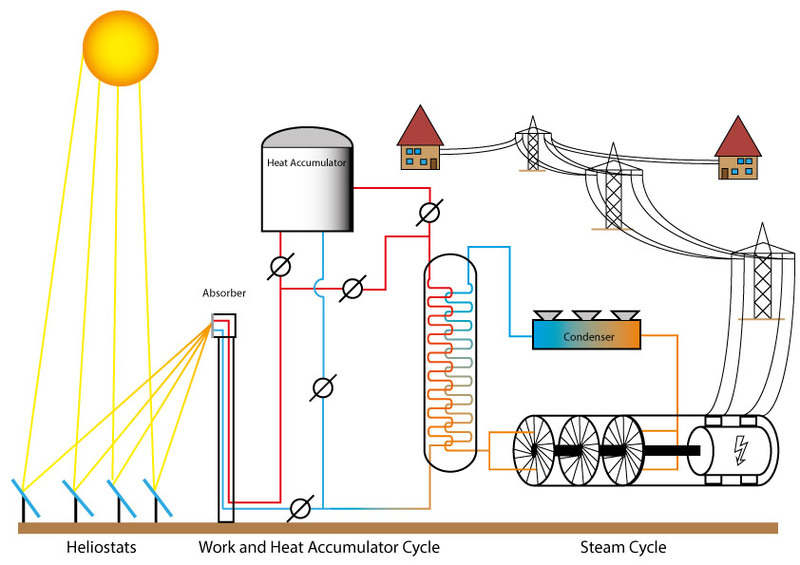 The best conditions for this type of power plant are found in the sunny, low-precipitation parts of the world. Dry desert regions with long and intense sunshine are preferable. The Spanish Sierra Nevada is an ideal location but also a location where harsh environmental conditions prevail. The plastic or metal connector housings and their sealing materials have been designed so that they are resistant to dust, ozone and UV radiation. As with any outdoor application, the connectors must also be able to easily withstand severe temperature fluctuations. The distribution boxes are hermetically sealed and protected against moisture. They have only one membrane to equalise the pressure during fluctuating environmental temperatures. The operators of this facility are relying on HARTING connectors to ensure this housing seal and to safely supply the power and data. Our Han series is used to supply the power. The data for the correct mirror adjustments can be transmitted via Ethernet networks with electrical RJ45 PushPull connectors or connected via PushPull LC optical duplex connectors. If there is a malfunction at a distribution box, the problem is that the data lines are connected in series and, in the worst case, the other heliostats may no longer be properly supplied with their critical adjustment data. For this reason, the cables are connected using a daisy chain topology. This allows service personnel to connect the input and output connectors to each other during service work, thereby bridging the defective station without influencing other stations. Using HARTING's robust and reliable connectors together with highly resistant cables from a partner manufacturer, the operators of this solar thermal power facility are obtaining their complete cabling and connector solution from a single source. This ensures a smooth, well-coordinated solution with optimal performance, and contributes to the ecological and economic success of the solar power tower.